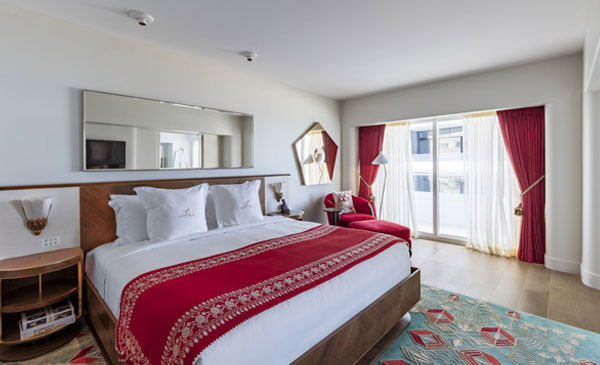 The Faena District Miami Beach is the second part of Alan Faena’s second act, a transformation from fashion designer to cultural engineer. It is the sequel to his first real estate project at Puerto Madero in Buenos Aires, which followed success in the fashion industry in Argentina, his country of birth. 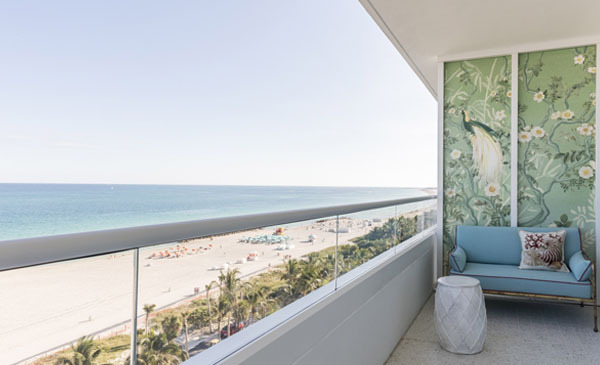 Known for his uniformly white wardrobe, including a fedora, Faena is in ebullient form, walking the site at least three times a day as his project in mid-Miami Beach comes to life. ‘It is the future. A unique, utopian city for the mind that thinks in 360 degrees,’ he says. A typically bold statement from a man – in his 51st year – whose ambition remains undiminished. For Faena, though, it is more than that – ‘unique’ is a word he uses frequently. 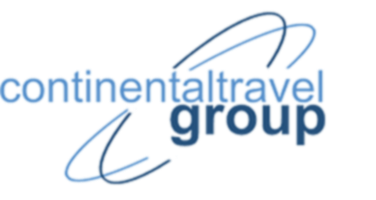 This project has a point of view and coherence that comes from thinking big. Faena isn’t leaving anything to chance. The massing of the architecture either side of Collins Avenue, the main drag of Miami Beach, sees four larger beachfront towers cradle the Faena Forum, an arts-retail- parking triumvirate from OMA that backs on to Indian Creek. 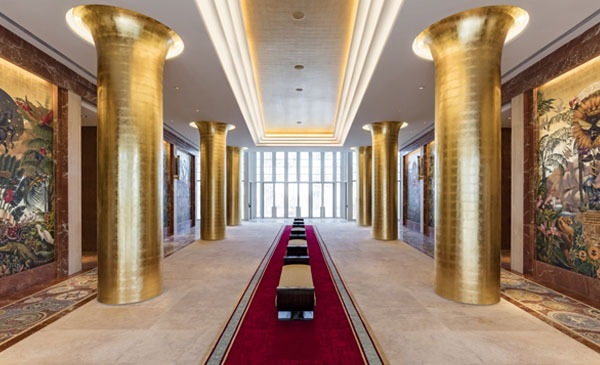 Sandwiched between a couple of historic piles are two new residential towers, the recently opened Faena House and Faena Versailles Contemporary, both designed by architect Brandon Haw, who was still with Foster + Partners when Faena House was initiated. The facades of both new buildings create a unity with the art-deco heritage of the former Versailles Hotel (now the residential Faena Versailles Classic) and the Miami modernist architecture of the former Saxony Hotel, now the Faena Hotel Miami Beach and the catalyst for the whole development. ‘They can create magic and elevate people,’ – Baz Luhrmann. The lavish reinterpretation sees public spaces such as the grand ‘cathedral’ entrance brought back to their former glory – but now adorned with dramatic gold leafing and specially commissioned murals by artist Juan Gatti – and theatrical guest rooms that encapsulate old-world grandeur with lashings of sumptuous Faena red velvet and cool blue-tiled bathrooms. The final parts of the plan are similarly curated. The importance of public art is seen in installations from Antwerp-based Studio Job and US artist Jeff Koons, while the cultural programme of the Faena Forum is guided by executive director and Chair of Faena Art Ximena Caminos, Faena’s wife. Similarly, the retail offerings in the Faena Bazaar will nurture emerging talents rather than compete with the luxury goods hub into which Craig Robins’ Design District has evolved. The Faena District is only the second neighborhood to be given ‘District’ designation in Miami Beach since the Art Deco Historic District in 1979. 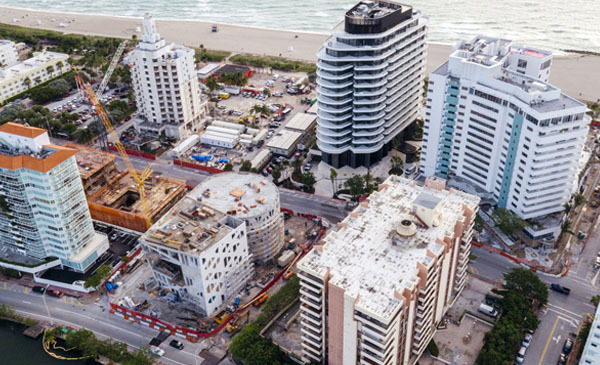 Mid-Beach was latterly associated with the wrinkly- skinned retirees that still exist in body- beautiful Miami, but as the spectacular wave of luxury hotel developments testify, the area is undergoing a seismic change. 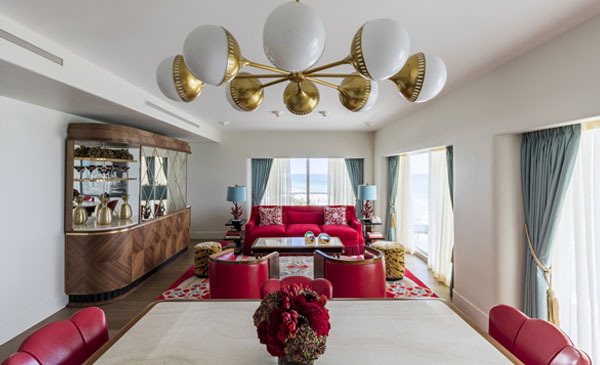 Faena has orchestrated a gifted array of strong-willed talents to create a harmonious symphony that marries heritage with modernity.